Predicted local rainfall amounts have been reduced. Weather forecasters are now predicting the Ohio River will not exceed minor flood stage by the time it crests here on Monday. Rain heading our way tonight may alter that forecast should the system stall or change direction. Any residents having any damage as a result of flooding since Tuesday are asked to document the damage or loss should the information be needed if assistance is made available. 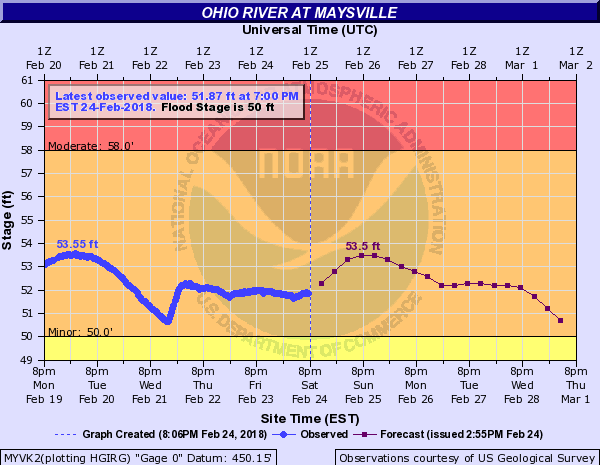 The Ohio River level at Lewis County is expected to be in the 54 foot range by the time it crests here on, according to officials with the National Weather Service in Wilmington, Ohio. On official with Kentucky Emergency Management said the expected flooding will “not be quite as significant at the 1997 event but it will be very close. Since that time, FEMA has purchased many affected properties and residents in the flood-prone areas have relocated. Judge Executive Todd Ruckel says local officials are prepared for the minor river flooding and are also prepared should rains tonight and Sunday morning result in any additional flash flooding in the county. Ruckel said emergency shelters can be activated on short notice should the need arise and added road crews will be on standby to make any emergency repairs to roadways, culverts and bridges, if needed. Emergency Management Director George Sparks said the latest forecast is welcome news and added he will continue to closely monitor the weather situation and will be prepared with any appropriate response. For information or assistance call the Lewis County Emergency Management Office at 606-796-3464. In an emergency call 911. Residents who experience damage or loss should document the loss through photographs and a written record. Contact the Emergency Management office to report the loss and have an assessment made. 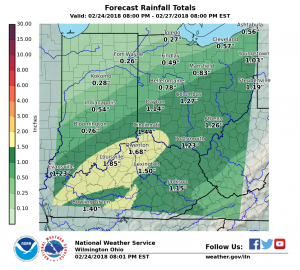 National Weather Service officials have said we should expect several rounds of prolonged moderate to heavy rainfall for the area through the weekend. There will also be some high winds associated with the incoming cold front tonight. “Specific river forecasts are highly dependent on exactly where the rain footprint is placed, which leads to a lower confidence in the exact crests that are being forecast,” according to an official with the NWS office in Wilmington, Ohio. Embedded thunderstorms are possible tonight, according to the latest precipitation forecast. Some of the storms may be capable of producing damaging winds after midnight. * At 6 PM the stage was 51.8 feet. * Flood stage is 50 feet. High confidence on more rounds of moderate to heavy rain tonight through early Sunday morning. Specific river forecasts are highly dependent on exactly where the rain footprint is placed, so a lower confidence in exact timing and height of crests. Isolated flash flooding possible. * More rainfall is expected, with the potential for heavy rainfall at times tonight. Additional rainfall amounts of 2 to 3 inches will be possible. Some of higher rainfall rates in thunderstorms may lead to flash flooding later this evening into the overnight hours. * Excessive rainfall will cause local rivers, creeks, and streams to rise. Those near streams and rivers should be especially cautious as streams and rivers can rise quickly.